Muriel Lake, a shallow lake located near Bonnyville, Alberta, has experienced rapid declines in water levels in recent decades. The Muriel Lake Basin Management Society expressed interest in opening channels that had been blocked by beaver dams to help restore water levels to the lake. Solstice was retained to aid the Society in reaching this goal by constructing and using pond leveller devices to restore flows into Muriel Lake. Pond levellers allow beaver dams, and in turn, beavers, to remain on the landscape by lowering water levels, while also sustaining ponded water for plants and wildlife and eliminating the cost-intensive need for constantly removing beaver dams. 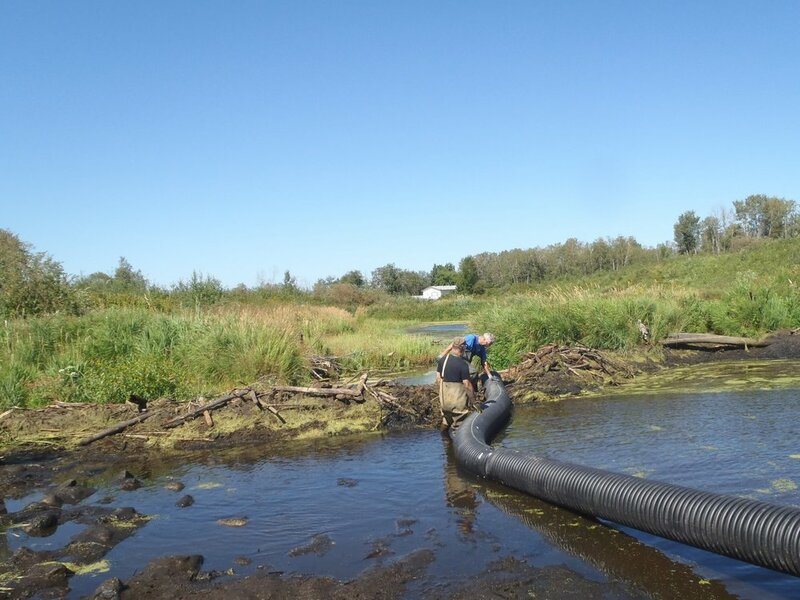 These devices have been proven as cost-effective alternatives to beaver management, aiding in the reduction of flooding and dam-associated blockages. Several pond levellers have since been installed within the Muriel Lake Watershed. Volunteers from the Society gained valuable training experience during Solstice-led installs and the Society has since installed pond levellers on their own with great success. Solstice consultation has been provided for decision-making and further guidance, as requested.